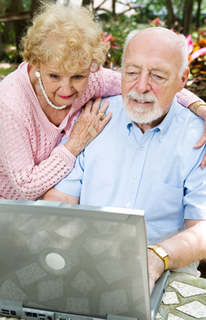 “ I consider myself fortunate in having found you when searching for retirement advice. The service exceeded all my expectations with everything handled quickly and efficiently and the outcome is much better than I expected, thanks to your efforts. “ A very complete and efficient service which resulted in a very satisfactory completion and better terms than other companies. Your advisers were extremely helpful and dealt speedily with my queries and doubts and it was a pleasure to receive such superb service and attention. “ I would like to thank you for a very professional job and I will be recommending you and sharingpensions to my friends, some of whom are in a similar medical situation. All I have to do now is outlive the prognosis! An enhancement is an additional level of income that can be paid to you as the provider underwriters expect you to live a certain number of years less than the national average. It is also referred to as an impaired life annuity, ill health annuity or smoker annuity. In the UK up to 60% of people retiring could qualify for some enhancement which would be paid for your lifetime. For example, for a male aged 65 according to the Office of National statistics would be expect to live for 17.3 years and a female for 20.4 years. If mortality data for a medical condition or lifestyle reduced this by 3 years the provider may be able to offer 20% more income and still payout the same total amount for someone in good health. The providers are adding more medical conditions all the time for both lifestyle conditions and more serious impiared health conditions. Since impaired annuities were first introduced to the UK in 1995 with more than 1,500 so far. An example of some of the medical conditions is shown below. Please enter your medical conditions on the impaired annuity quote and provide as much detail as possible to in order to receive the highest rate as information omitted could reduce the level income of income offered. For lifestyle enhancements up to 18% more income than the highest standard annuity can be offered. Compared to annuity offers from existing providers, this is in addition to the 10-25% a standard annuity can offer. There are now a wide range of lifestyle conditions that can qualify for enhancements such as taking prescribed medication for common conditions like high blood pressure or high Cholesterol. Information about your blood pressure reading can also improve the rate if this is not normal. Others include being overweight with a BMI index of 34 or more as well as different categories of smokers such as regular smokers of manufactured cigarettes, numbering less than 10 per day, 10 or more per day or those that have stopped in the last 6 months. For impaired health up to 40% more income than the highest standard annuity can be offered. Compared to annuity offers from existing providers, this is in addition to the 10-25% a standard annuity can offer. For more serious conditions greater enhancements can be offered for impaired health. The more common conditions are diabetes, heart conditions and cancers but consideration is given to thousands of other medical conditions. In some cases these conditions have residual effects on a person that can be considered such as stroke and paralysis. In this case activities of daily living can be considered that can increase the impaired annuity offered. For diabetes you may have associated problems that can further enhance the annuity offered such as problems with your eyes, poor circulation or heart conditions. Even an unusual HbA1c reading can itself improve the annuity quote. If you suffer from a respiratory condition such as asthma or sleep apnoea the severity can improve the rate if you also use a CPAP machine, face mask or suffer from breathlessness or have been hospitalised. How much enhancement can you receive? The following chart is based on a person aged 65 with a fund of £50,000 purchasing an impaired annuity on a single life, level, no guaranteed period payable monthly in advance. It shows the gross income payable for a small selection of lifestyle enhanced and impaired conditions based on actual results for people retiring. The lowest standard quote is similar to many existing schemes offering and the highest standard is the best open market option quote, in this example offering 17.4% more. Source: Sharingpensions.co.uk research for a 65 year old with a fund of £50,000 on a single life, no guaranteed period and monthly gross advance basis. 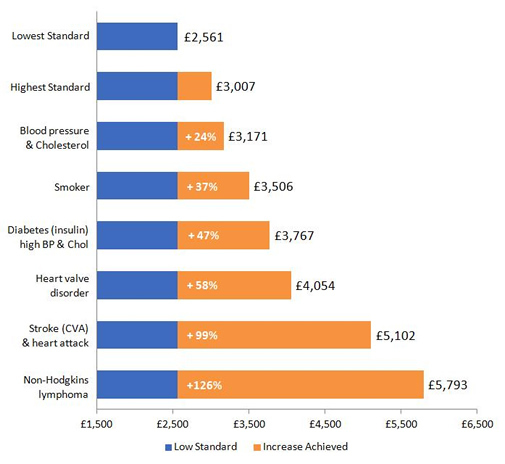 For lifestyle conditions such as high blood pressure, high Cholesterol, smoking or being overweight you could receive 18% more income than the highest standard rate of £3,007 pa shown above with a combination of these as offered by an enhanced annuity. For more serious illnesses such as diabetes, heart conditions, cancers, strokes or if you have been hospitalised our clients frequently receive up to 40% more income than the highest standard rate of £3,007 pa from an impaired annuity. Higher enhancements can be offered especially for a combination of recently diagnosed conditions. Find out how much you can receive from the highest standard annuity, either complete our quote form or call 020 8816 7501 today. Sharingpension.co.uk was created by its founder Colin Thorburn in 2002 to provide a free pensions and annuity resource to hundreds of thousands of people at retirement making their decision making easier. Colin Thorburn has nineteen years experience in pensions and annuities, is an individual authorised by the Financial Conduct Authority and business is submitted through Blackstone Moregate Ltd which is authorised and regulated by the FCA (no. 459051). Suitable if your fund is £5,000 or more after tax free cash. To receive the highest income for an enhanced annuity rate with your medical condition(s) it is important to supply as much information as possible. Please include dates you were diagnosed, any surgery with dates, medications, readings for high blood pressure, Cholesterol and diabetes as these could help to maximise the enhancement.